If you have ongoing medical conditions, drug or food allergies, or take multiple medicines, your doctor has probably recommended that you wear a medical ID. That’s because medical IDs are a simple way to communicate important information to first-responders in an emergency. Benefits of wearing a medical ID? 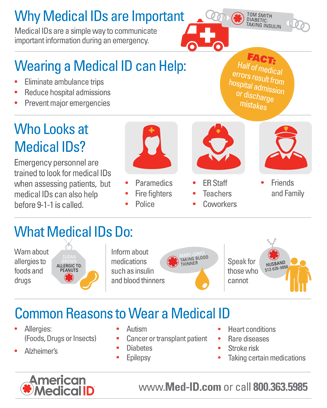 Medical IDs save lives: they eliminate trips to the hospital, reduce unnecessary hospital admissions and prevent minor emergencies from becoming major ones. In an emergency, when you might be unable to speak for yourself, a medical ID bracelet or necklace speaks for you. Half of all medical errors occur because of mistakes made upon admission or discharge from the hospital. Wearing a medical ID protects against potentially harmful medical errors. Prompt diagnosis is critical to effective treatment, but symptoms of common ailments can easily be misdiagnosed. A brief description of vital medical facts engraved on your medical ID ensures appropriate and timely medical care.